Buy Aroma Magic Help Me! 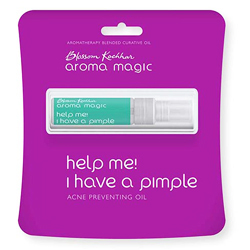 I have a pimple - Acne Preventing Oil - Pimple free skin, Balances Oil Secretion, Prevent Pimples. An aromatherapy formulation made from essential oils of tea tree, peppermint and juniper berry. Potent blend of pure and natural oils helps to treat and prevent pimples. Balance the oil secretion and penetrate deeply to treat the root cause of acne, resulting in pimple free skin. Safe and natural with no side effects.